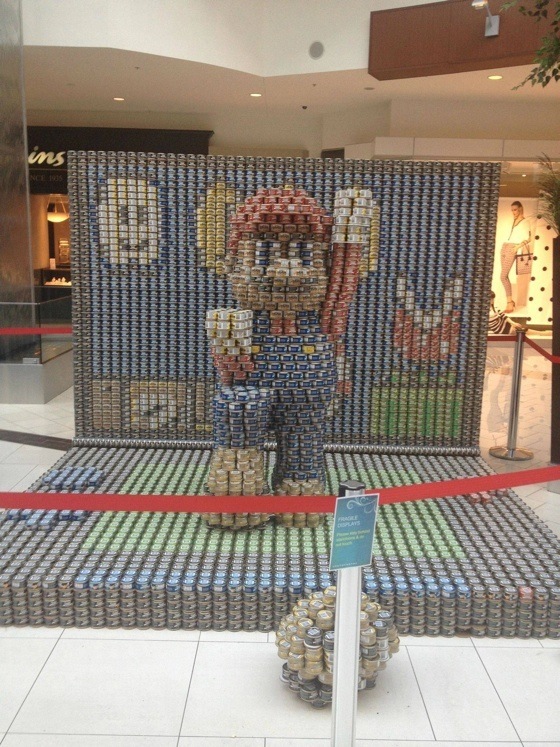 Ok, so this crazy Super Mario display isn’t technically a “craft”. But I still thought it was cool enough to share with you folks anyways. I’m sure someone put in a lot of hard work to design, and then lay this crazy display out. It sounds like it’s even for a good cause. Go Calgary! As many have already noted, the display is built to support our local foodbank through the ‘Canstruction’ event; many cities throughout the world have their own ‘chapters’ and at the conclusion (Calgary structures will be up until March 21st) all food items are donated. I believe Calgary is going on their 8th year of participation and the cumulative total of donated food is in the hundreds of thousands of dollars. Each participating team is comprised of or sponsored by local companies. The structure is made from nearly 11,000 small snack sized tuna cans and close to 200 pieces of individually cut and scalloped 1/4″ hardboard between each of the layers. The model was developed from scratch in AutoCAD using only the artist’s eye, this allowed each of the layers to be plotted (to scale) and overlaid on top of the hardboard for accurate positioning / cutting. The wall was developed in Excel by importing cropped pictures of all the different cans and their varied rotations and then shrunk to fit their respective ‘2×1’ pixel. And the red can in the corner is the power light of the 3DS.